I read this article and found it very interesting, thought it might be something for you. The article is called Garb: It’s A Cinch – Úna Burke and is located at https://www.totallydublin.ie/more/fashion/garb-its-a-cinch-una-burke/. 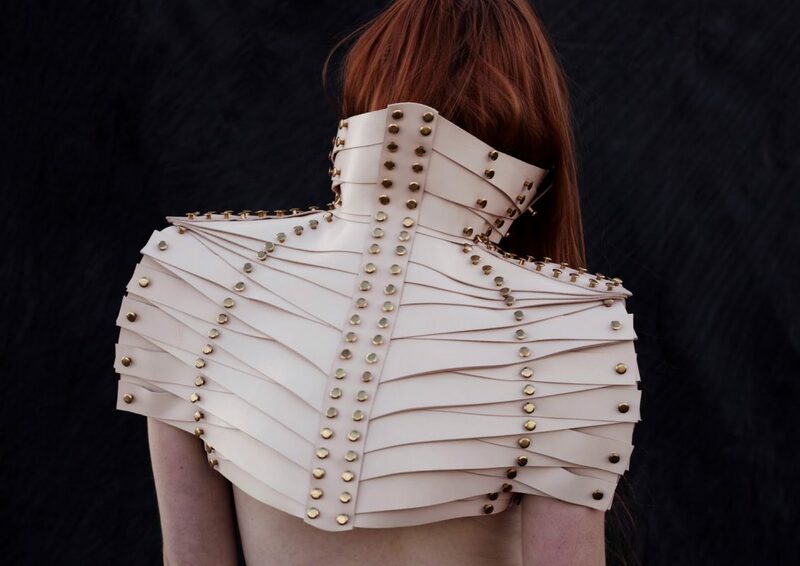 Since the inception of the Roscommon-born designer’s luxury hand-crafted leather label in 2007, Úna Burke’s inimitable artisanal work has steadily grown in popularity to stratospheric proportions. Her avant-garde style gaining fans in Rihanna, Lady Gaga, fashion icon Daphne Guinness, with collections regularly appearing in Vogue, i-D Magazine, and a special collaboration for The Hunger Games: Catching Fire. We caught up with Úna just landed back in London after her Paris Fashion Week presentations. Your work is renowned for its strict sculptural quality. When you are creating a piece, how do you relate it to the human form? What is the process? I work directly on the human form and on the mannequin, so that’s how the pieces evolve rather than me starting out with a sketch. So I will play with my leather and develop construction techniques and bind those to the body. Everything is based around awareness of what women want to feel like when they’re wearing the pieces, so there’s threads of corsetry, and the functionality of corsetry and how it straightens the body; the back is straight, or the shoulders go back. The woman looks and feels proud and also gives an aura of strength. 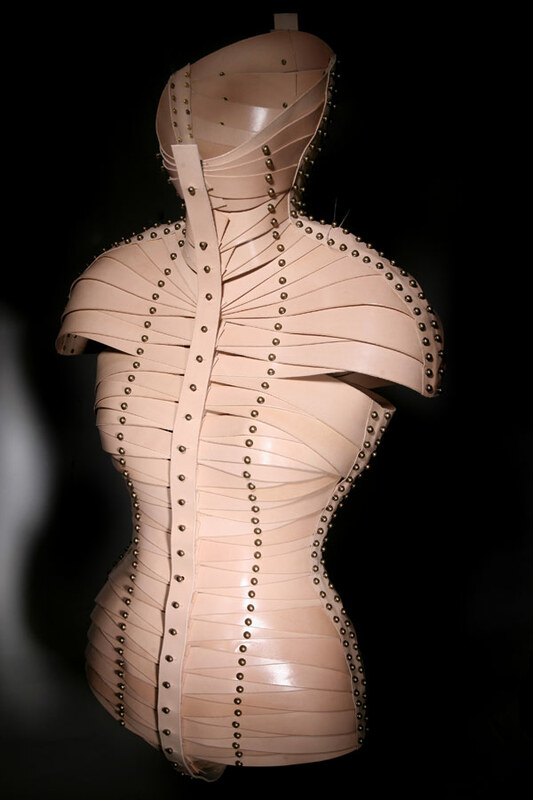 There’s a piece that’s almost like a Victorian collar, from SS13, and that makes the wearer almost raise their head. My process is very much conscious of the human form and what women want to feel like. I’m a woman and I know what we’re worried about and what we’re not worried about. When somebody’s fitting something on here, as sometimes we do private showroom appointments, I would suggest ways around what areas a customer is worried about. Could you talk you through the concept for your latest collection? Or the themes that you find that you come back to? There are certain things that always come through and then, in each individual collection, these different ideas will be interpreted in a different way or there will be different versions of the same end point. In many ways there is a great consideration for *opposites*, how good and evil, or black and white are necessary for each other to co-exist and the irony within that. Also, how a positive experience can become a negative, and a negative one becomes positive depending on perspective and how the human mind processes it. Then that leads us on to the human mind itself and my interest in psychology and how that always influences the concepts I deal with within a collection. I’m very much a people-watcher, I’m deeply interested in human behaviour and sociology as well as psychology. This leads us to military armour and how it is an obvious form of strength. It’s about empowering women and making a women stand tall and feel proud of herself, whether she’s wearing a bracelet from the collection or whether she decides to go a little bit braver and wear a belt, or if she decides to be even braver and wear one of the bigger pieces. It’s about always finding the strong woman within, as there is always a strong woman within whether we are at the point in our lives whether we show it or not, or more obviously than some. But even if we hide it, that woman is very strong within and [my work] is representing that in a physical way. Also my process being craft-based is part of a set of values that I have. Whether it’s a woman wearing a piece or even a man wearing one of our bracelet – we even had [fashion designer] Philip Lim buy an art piece from us – the people that appreciate our work appreciate our set of values; which is to do with longevity, valuing the time and love and effort, physically and mentally, that has gone into something made by a human being not by a machine. These things are important to me as the designer and to the team working here, who are all working to the same goal with the same ethics in mind, so it’s very honourable. The process and design of the pieces are timeless, it’s not throwaway fashion, and it’s never supposed to be that. What I do is very much against that ‘fast-fashion’ movement that we have at the moment that isn’t good for the environment. I feel it’s miss-educating people, people aren’t aware of quality as much, they don’t care about it as much as they used to in the past. I guess I’m kind of old-school in my thinking. You studied MA Fashion Artefact at Cordwainers College, London. Do you see your work as being of the fashion world or art world? I’d say I’m somewhere in between. I would say it depends on the piece, to be quite honest. My graduate work I would consider art pieces because that’s what was most important to me when I was making them, I wasn’t considering the fashion aspect, I wasn’t using the body as a canvas, I was using it as a reference point. With the fashion collections I’m thinking about wear-ability and how its wearer feels and how the body straightens up and so on. For the Prosthetics exhibition at the SHOWstudio Gallery in Knightsbridge they stood alone. We constructed them in a way that they were bound closed and had pieces of wood inside of them. They looked ghostly and haunting, and I would have loved to use them in shoots but couldn’t because they were pieces that were apart from the body, and that, in essence, kept to the original concept. What projects do you have on the go now? Well most recently, a project that I was absolutely thrilled about was the project with Lexus. Lexus sent us their leather that they use in the interior of their VT cars and we made a dress from it and a shoulder piece. Every aspect of the project was fun, the making of it itself was challenging because it was a different kind of leather. It was a softer leather than what I would normally work with so it was difficult with some of the tools. There’s lots of problem solving! On the day of the photoshoot for The Guardian Magazine myself and my assistant went for the actual filming part, which was launched on September 5th on The Guardian’s website. There was fire and everything, lots of drama on the day! That project was really fun, and great to work with the people shooting it on the day, which very often we don’t get to do.